EDITION RECORDS’ impressive relationship with Scandinavian and other European artists, forged over the past few years, continues with pianist and composer Eyolf Dale’s Wolf Valley. Having previously released a handful of solo albums in his native Norway, as well as appearing as sideman on many recordings (including tubist Daniel Herskedal’s Slow Eastbound Train), Dale’s compositional expertise is brought to life here by broader forces – a colourful and adaptable octet of piano, bass and saw, drums, tenor sax and clarinet, trumpet, trombone, vibraphone and violin. Greatly influenced by classical music, jazz, improvisation – and, most likely, the folksongs and landscapes of his homeland – the pianist’s eclectic output is distinct in its compositional spaciousness and instrumental diversity. Within such a spirit of invention, numerous musical boundaries are traversed, providing so many rich discoveries along the way. Dale’s scaleable and constantly fluctuating episodes – one moment ‘big band’, then ‘chamber orchestra’ or ‘minimal atmospheric’ – are the key to these nine generous tracks. For example, gentle horn grooves in opener Furet are embellished by coruscating vibes and bluesy piano; and all at once the mood drifts into the cinematic longing of Fernanda, whose attractive, flowing undercurrent is elaborated upon by lyrical clarinet and violin, swelled by Dale’s beautiful eight-piece orchestration. Based on a previously-recorded improvised organ chorale, Shostachoral‘s sustained progress, featuring André Roligheten’s gruff, melancholic tenor, is reminiscent of John Surman or Jan Garbarek; and Ban Joe‘s folksy animation (cannily resembling a banjo accompaniment) pauses delicately amongst vibraphone ripples before breaking into exuberant piano jazz – but stay focused… this musical journey keeps moving on! Combining funereal, New Orleans-style marching band with a weighty, prepared-piano bass pulse, Sideways restlessly portrays its themes of loss, adding classy solo trombone and trumpet improvisations, whilst Tegistein‘s empty, industrial landscape of sinuous screeches and echoes grabs the attention. The Creek‘s playfully clattering groove is another standout, full of dancing piano riffs, syncopated horns, languid jazz trumpet, audaciously fluttering tenor and delicate vibes-decorated textures (so much to enjoy); the quiet, slowly unfolding solitude of Silent Ways, complete with wavering saw, is oh so delicate; and fast-paced The Walk sparkles brightly, thanks to ticking percussion and a sumptuous octet arrangement. Eyolf Dale and his accomplished personnel breathe so much into this vast panoply of creative ideas, presenting a recording which is a pleasure to delve into more and more deeply – and it’s bound to remain a favourite for some considerable time. Thank goodness for our resolute, European, musical connections. Released on 10 June 2016, Wolf Valley (direct translation: Eyolf = Wolf, Dale = Valley) is available as CD and high-quality download at Bandcamp. IT WAS JUST THREE YEARS AGO that a young Norwegian saxophonist, Marius Neset, powered onto the wider European jazz scene, staggering audiences with his breathtaking, mind-boggling tenor and soprano wizardry. Here was a musician with the world at his feet, already leaving excited, jaw-dropped crowds funnelling out of venues, incredulous at what they had witnessed. Following his album Golden Xplosion (Edition Records, 2011), hailed enthusiastically by critics, and a remarkable duo release with tubist Daniel Herskedal (Neck of the Woods – Edition, 2012 – reviewed here), Neset wasted no time in further broadening his outlook, releasing Birds (Edition, 2013 – reviewed here), which revealed as much about his compositional stature as it did his astounding playing. Although writing for, essentially, a quintet (with Ivo Neame, Jim Hart, Jasper Høiby and Anton Eger, plus guests), it was clear that he could express himself on an orchestral scale, laying down the written complexities of contrapuntal hooks and darting time signatures whilst also communicating and improvising with his colleagues on a profoundly visceral level. Famously mentored and inspired by Django Bates (at the Rhythmic Music Conservatory, Copenhagen) and influenced by a list of musicians and composers as long as one of Neset’s extended solos (Wayne Shorter, Jan Garbarek, Michael Brecker, Chris Potter, Pat Metheny, Frank Zappa, Radiohead, as well as Grieg and Stravinsky… to name but a few), he now makes his ACT debut with a release which widens his ambition to write for larger forces. 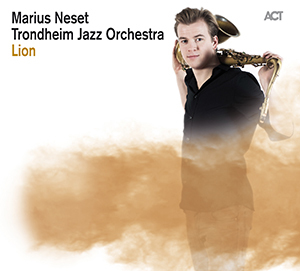 Resulting from a commission to compose specifically for the renowned Trondheim Jazz Orchestra’s billing at the 2012 Molde Jazz Festival – including Lion, the ten-minute title track which heads up this recording – Neset decided also to re-visit a few numbers from his previous releases, pulling them all together in this impressive 64-minute outing. The Trondheim’s twelve-piece arrangements, here, often display the variety and openness of orchestral timbres, as well as the sectional horn solidity of a big band – hence the name and their particularly open and eclectic sound – and this, therefore, is the perfect vehicle to deliver the potential of Marius Neset’s vision. From its disquieting but then stately entry, opening number Lion becomes a boisterous affair very much in the Neset style, brassy stabs leading to a freer environment of imitation growls and general foreboding before Erik Johannesen’s terrific trombone soloing reinstates big band grandeur; and, to close, the ‘king’ slopes into the distance to a more softly pulsating rhythm (tremendous imagery). Golden Xplosion kicks off with Marius’s trademark, hypnotic, ‘self-accompanied’ tenor, punctuated by rhythmically-teasing reeds. Listeners familiar with the original will surely be drawn to this increasingly voluminous, sparky arrangement, Neset extemporising magnificently over Petter Eldh’s pounding bass and Gard Nilssen’s flamboyant drumming. In The Ring appears to be ’round two’ of Boxing (from the Birds album), its hard-hitting drums appropriately packing a punch, and the balance of power, agility and space calculated perfectly (with Neset’s mouthpiece popping to some superb trombone and bari action) – and is that a sense of dazed resignation that follows, before the final knockout?! A short tenor Interlude leads to Sacred Universe, another creative reinterpretation for this versatile jazz orchestra, Petter Eldh’s industrious, vocalised bass solo opening the floodgates for a real showpiece of ensemble writing and wide-ranging soloing. Weight Of The World rasps brusquely to Eirik Hegdal’s up-tempo baritone and Eldh’s characteristically percussive bass; once again, the diversity and lucidity of the performances need to be heard to grasp Neset’s mastery of arrangement, eventually blazing with brassy brilliance – a real standout. Away from that intensity, Raining is the most luscious of ballads, Jovan Pavlovic and Espen Berg offering homely accordion and piano before the scoring swells; and Daniel Herskedal’s distinctive cantabile tuba combined with Peter Fuglsang’s quietly folksong-like clarinet over muted piano string ‘raindrops’ is otherworldly. Finally, Birds is returned to its grander concept, building instrumentally, one by one, to a thrilling, cacophonous dawn chorus. Released in the UK on 21 April 2014, Lion is certainly an album to get your teeth into. Additional information and audio samples here. Video of Birds at 2012 Molde Jazz Festival here. Video of Golden Xplosion at Bergen JazzForum, 2013 here.